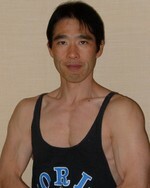 リラクゼーションや体づくりのパーソナルトレーナー　静岡地区 Personal trainer in Shizuoka area: Exercise & Language Instructor Fitness journey ENDO's Walk on ! Hi guys ! These photos are back of myself that I took after today's workout (Nov 11th 2018). I have to train trapezius muscles more. My personal training sessions are available for weight loss, body making, stress reduction, and fitness for special populations.